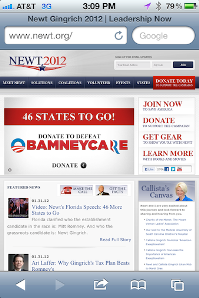 Despite pronouncements that they are pro-technology, all of the U.S. presidential candidates have made fairly feeble attempts at building mobile campaign websites. "It's appalling how poorly their mobile websites work," said Joshua Bixby, who has analyzed desktop and mobile websites of the Republican frontrunners and President Obama. Bixby is president of Strangeloop, a Canadian Web software company that has no connection to any of the campaigns. In a blog post in which he shared his most recent findings about candidates' websites, Bixby says he encountered slow site load times -- some took several minutes on smartphones -- and basic functionality problems. Computerworld performed several of the same informal tests as Bixby did, and in some cases found even poorer performance than he did. The findings suggest that politicians may not be doing a very good job of reaching out to voters who are using smartphones and tablets in far greater numbers than they were during the 2008 presidential campaign, Bixby says. He joined other election observers in predicting a big upsurge in campaigns focused on mobile device users. MittRomney.com screenshot by iPhone 4. "None of the candidates' sites rose to the challenge of designing for mobile devices," Bixby wrote in his blog. One key ingredient of a good mobile website is that it should offer the ability to link to the full desktop site, not just provide a view of a stripped-down mobile version, Bixby added in an interview. He said surveys have shown that at least one-third of mobile users strongly favor access to a full site from a mobile device. 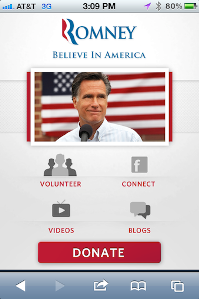 What Bixby found was that of all the Republican presidential candidates, only Mitt Romney's campaign had designed a mobile site with a link to the full-size MittRomney.com website. All of the other Republican candidates, as well as Obama, have adapted their full-size desktop websites to run on mobile platforms -- a tactic that can work well, or not, for many different reasons, Bixby said. In some cases, "responsive design" principles have been used, which means that developers have designed desktop content to adapt to a variety of devices, including tablets and smartphones. Computerworld found that Obama's mobile website does include an apparent link to the desktop version of the president's campaign site, but clicking it repeatedly led to a page that said, "Sorry, the page you are looking for is not here." 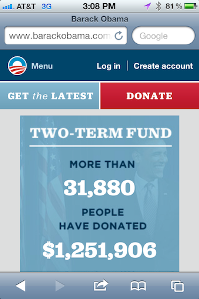 BarackObama.com screenshot by iPhone 4. Bixby and others credited Obama's 2008 campaign for having a sophisticated digital operation that included a mobile strategy, but critics have noted that the president's 2012 website falls down, particularly for mobile users. "It is on the iPhone where the trouble [with Obama's 2012 site] actually starts," wrote a blogger for TheBrickFactory.com . That blogger cited the same error message that Computerworld found when trying to jump to the full site, and also drew attention to the need to "scroll forever to access all the content," saying "Instead of being optimized for mobile, it feels like a version of the main site shoehorned to fit in a mobile browser ." Bixby said the mobile version of MittRomney.com had a link to the candidate's full website that worked when he tested it multiple times. However, in a Computerworld test, the link to the full site repeatedly (ten times) returned the user to the mobile site. "That's a huge error," Bixby said of the Computerworld finding. So it appears, at least in terms of the inability to link to a full website from the mobile site, that a Obama-Romney presidential contest is a close race. Bixby also found that the candidates' websites loaded more slowly on desktop computers than many commercial websites did. But the load times on mobile devices were even slower, sometimes several minutes, he found. Over a Wi-Fi connection, an iPhone loaded all of the candidates' sites in 10 to 20 seconds, according to Bixby. And he said that load times "ranged from slow to unbearable" on an Android phone connected to a Rogers 3G network in Canada. He noted that Romney's site loaded in 21 seconds on an Android phone via a 3G network, but the home screen failed to size properly in the browser, cutting off the candidate's name at "Romn." Bixby said it took several minutes to load the other candidates' sites on Android devices with 3G connections. However, in Computerworld tests using an iPhone over a Verizon Wireless 3G network in Virginia, both Obama's and Romney's sites consistently loaded in less than three seconds. Newt.org screenshot by iPhone 4. When it came to loading desktop Web pages, Republican candidate Newt Gingrich's site turned in the best performance, 7.7 seconds, while Obama's site came in last, at 13.6 seconds, according to Bixby. But mobile devices are what people are interested in, and mobile strategies should be a higher priority for the candidates, Bixby said. Bixby joined a number of independent analysts in urging the candidates to devote more of their campaign war chests to their mobile websites, given the explosive growth in mobile devices and the level of social interaction they support. "Given the millions of dollars being spent on campaigns, mobile should be a higher priority," Bixby said. Matt Hamblen covers mobile and wireless, smartphones and other handhelds, and wireless networking for Computerworld. Follow Matt on Twitter at @matthamblen or subscribe to Matt's RSS feed . His email address is mhamblen@computerworld.com. This story, "Presidential Campaign Mobile Websites Lack Savvy" was originally published by Computerworld.